Monday, Easter VI: "the Spirit of truth who proceeds from the Father"
Only when the hour has arrived for his glorification does Jesus promise the coming of the Holy Spirit, since his Death and Resurrection will fulfill the promise made to the fathers. The Spirit of truth, the other Paraclete, will be given by the Father in answer to Jesus' prayer; he will be sent by the Father in Jesus' name; and Jesus will send him from the Father's side, since he comes from the Father. The Holy Spirit will come and we shall know him; he will be with us for ever; he will remain with us. The Spirit will teach us everything, remind us of all that Christ said to us and bear witness to him. The Holy Spirit will lead us into all truth and will glorify Christ. He will prove the world wrong about sin, righteousness, and judgment. "If you love me, you will take out the trash." "If you love me, you will wash my car." "If you love me, you will let me have the TV remote." We choose to love limited human beings, and they sometimes put conditions upon love. We want love: to love and to be loved. But we do not particularly like being told how to love because we want also to be free in loving. We are "hard wired" to hope for these things but at the same time we are assured that there is no rational basis for hope. Despite this it is hard to deny that the hope of love and the struggle to achieve it are constants in the life of every human person. The seat of reason, and its operation in the mind, can be demonstrated through scientific examination, and its processes measured and studied. Hope, on the other hand, is more elusive. We do not know where hope comes from, and why some people seem so able to consistently live by its tenets and others seem so bereft of it that they can be said to hardly be living at all and sometimes choose not to go on doing so. Young couples want to be free to love whom they choose as demonstrated so dramatically in the perennially favorite classic play, "Romeo and Juliet" and, tragically, sometimes do not choose well. Today people so often express their own version of love that, for the first time since records have been kept in the 1950's, less than half of all households express the committed love of man and woman through marriage, choosing concubinage or "living together" instead. The "spirit of the 60's", in which all idea of law was seen as a drag, seems to have reached its logical conclusion in this spurning of conventional covenant love through marriage. Why would God, if He loves us, make us with free will but then tell us what to do? Are not these two contradictory realities? We are told by Him "If you love me, you will keep my commandments". But if I am a free creature, why can I not choose how I am to love God? Why can I not decide what love means to me and why should not God out of love be willing to accept that? At any rate, it does seem that there is a matter to be resolved: that the ten commandments and all of God's demands seem to be a restriction of freedom rather than its guarantee and expression. Could we not go further and hope to find the answer in an examination of the teaching and example of the One whom we are told is one with the Father, who is in the Father and in whom we see the Father? The hope of freedom, if it is to find its goal, must not be frustrated by the seeming contradiction of law and Spirit, of commandment and love, if it is indeed to be hope and if we are indeed to be free. Just as the human person is capable of sacrificing even his or her very life for the sake of love, perhaps this seeming contradiction and our own ideas of freedom must be sacrificed for the sake of love. The Lord tells us He loves us and shows His love in the sacrifice of Himself on the Cross and thus gains our trust. He is one with the Father and His self-offering also bears for us in itself the gift of life, for God's life is made our own, is given also to us through the death of Christ on the Cross. And now we must live this life as our own and we are told that the gift of the Holy Spirit is the power we are given in order to live this life. But here again we find what seems a contradiction: the Spirit is often invoked as one's reason for doing something contrary to the letter of the law. Have you not heard it said also many times that this or that action or decision was made in order to be "faithful to the Spirit of Vatican II", to excuse or absolve one's violation of the letter of liturgical, sacramental or canonical regulations? This as if to imply that those on the "side of the Spirit" are motivated by love while those who invoke the law are not. Here again we find the contradiction between love and the law, and the notion that the Spirit is one who validates our own desires and whims. This conflicts with the ideal of freedom as taught in the Scriptures proclaimed today in that one bears fruit through the keeping of the law of another: the law of God. We learn that the highest achievement of freedom is accomplished in doing the will not of ourselves but of God. If we believe that God is love and that love alone lasts then it must be in love, which alone continues in that heaven of God which we seek and for which we hope, that the seeming contradiction between freedom and law is resolved. And this is precisely what Christ teaches when He says, "if you love me you will keep my Commandments". God is love and for that reason He will not fail us in our highest hope. And if love is our highest hope then it makes sense that we would use our freedom to seek His love so that hope will not be ultimately be disappointed. Love is the fulfillment of the law! The Spirit of God, fruit of Christ's passion death and Resurrection, is given us so that we might do what would otherwise be impossible without the help of God: be like God in loving Him and others. Yes, the commandments are God's gift that we might know what it is that we are now to do through the Holy Spirit which he pours out in abundance. And this is why we are told: "the Holy Spirit is given to those who obey God". Christ teaches that now, because of the gift of the Spirit, holiness is possible and is more than an obedience of conformity, whether willing or unwiling, to the restrictions imposed by the Commandments. "Jesus acknowledged the Ten Commandments, but he also showed the power of the Spirit at work in their letter. He preached a 'righteousness [which] exceeds that of the scribes and Pharisees' as well as that of the Gentiles. He unfolded all the demands of the Commandments. 'You have heard that it was said to the men of old, "You shall not kill." . . . But I say to you that every one who is angry with his brother shall be liable to judgment.' " (CCC 2054) Now, not only is murder forbidden, but the law of love makes unholy even the disposition of the heart which might give space to a desire to harm another. The indwelling Spirit empowers us now to resist such temptation. Only the logic of love will resolve for us what sometimes seems so difficult to reconcile: our hope of freedom and God's law. This is why Christ teaches us that love of God and neighbor is "the first and greatest commandment". "Moral existence", the heart in love with God and neighbor, seeks first and always to do good and thus only in second place is concerned with what God's law forbids. In the Church the bishop lays his hands upon every believer in conferring the Sacrament of Confirmation, that he or she might receive the Spirit of God's love, the third person of the Trinity, and thus live in the freedom of a child of God. And we who have been confirmed must seek to stir up the power of that Spirit through lives in which we see bodily compliance with God's commands simply as the evidence of the love in our hearts. Only in this way will we live not as servants but as the sons and daughters we have been told that we are. We cannot deserve God's love, but what a joy to choose to reflect Him through our words and actions. And what a solid foundation for hope do we find in this evidence of His love in us. Saturday, Easter V: "the world hates you"
S Philip Neri: "the Father loves me"
The epiclesis is also a prayer for the full effect of the assembly's communion with the mystery of Christ. "The grace of the Lord Jesus Christ and the love of God and the fellowship of the Holy Spirit" have to remain with us always and bear fruit beyond the Eucharistic celebration. 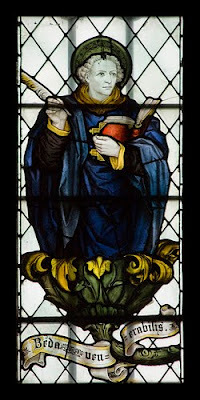 The Church therefore asks the Father to send the Holy Spirit to make the lives of the faithful a living sacrifice to God by their spiritual transformation into the image of Christ, by concern for the Church's unity, and by taking part in her mission through the witness and service of charity. S Bede the Venerable: "my words remain in you"
... I leave with you; my peace I give to you. Monday, Easter V: "the one who loves me"
Fruit of the Spirit and fullness of the Law, charity keeps the commandments of God and his Christ: "Abide in my love. If you keep my commandments, you will abide in my love." As many of you know the world was supposed to end today. It did not make much sense to put a lot of effort into a homily if the Lord Jesus Christ Himself was going to be present to preach in person. But I did manage to throw something together since the world and we are still here and a false been prophet has once again been exposed. The Lord is always with us. He gives Himself as an inexhaustible source of Faith and life, particularly here in the sacred liturgy through Word and Sacrament. And He is here for us whether or not we are here for Him. Sometimes those who have been with the Lord the longest, such as Philip in today's Gospel, seem to be the ones who know Him the least. Jesus is the way, the truth and the life. To know Jesus Christ, to be with Him, is already to know the Father, to know heaven where God has prepared a place for us. Sometimes, though, we like Philip betray a lack of knowledge of the One who gives Himself so abundantly in the Eucharist, the Scriptures and in the teaching of the Church and who is for us the way to abundant and eternal life. Though He is always so radically and generously available to us we sometimes find ourselves in the same situation as did Philip. The Lord could also rightly turn to us therefore and also say to us, "Have you been with me all this time and still you do not know me?" Gladly none of us would say we do not love God. We are here because we seek Him and we seek Him because we love Him and this is right and good. Perseverance in seeking the Lord is itself evidence of a loving faith. But even beyond the Sunday liturgy we are called to take the steps necessary to grow in our Faith. Have you ever met someone who no longer practices the Catholic Faith and who says, "Well, I was raised a Catholic" as if that status has exhausted all the possibilities for them of truth and life and love in God? There is often a presumption that however the Faith has been tried in the past there is no possibility that the Faith could ever hold any value or deeper truth or power for living in the future. GK Chesterton once said, "The Christian ideal has not been tried and found wanting; it has been found difficult and left untried." If our Catholic faith is the grace which gives us access to living the Christian ideal, to growing in the love of and in the image of Christ, could not the same be said of growth in the love of and knowledge of the content of our Faith? We could therefore also say, "The Catholic Faith has not been tried and found wanting; it has been found difficult and left untried." To lack knowledge of the person of Jesus Christ can happen even to those who, like Philip, have been with Him the longest, even some who have been Catholic all their lives. For many, even lifelong Catholics, there is sometimes a presumption against further study. We all know the stereotype of the Catholic who goes through CCD and stops at Confirmation, as if all knowledge of the Faith stops there. We could also hear from priests of how they prepare very carefully to offer a good RCIA class but find that those who are already Catholic presume they will not learn anything new through such instruction and no amount of cajoling will convince them to take part. To love Christ is to know Christ. Love must be a growing thing, therefore knowledge must grow together with love. The doctrinal content of the truths of our Faith is an inexhaustible resource. All of us are responsible to care for our Faith by taking the steps necessary to grow in our Faith. Catechesis is necessary for lifelong growth in the Faith, therefore catechesis is necessary throughout life. Catechesis is never about "old information", as perhaps in other areas of knowledge, because the Christ we come to know more fully through the doctrine of the Faith is ever ancient and ever new. When we review some doctrine or aspect of the Faith we grow in the grace of Faith so that it becomes an ever more firm foundation for our lives in order to give us the hope that we need which tells us that God is making a difference in our lives. Catechesis has various benefits for our faith and life. Some of these are spelled out by the Catechism of the Catholic Church which is the primary tool for catechesis in the Church. "- an ecclesial catechesis, for it is through the manifold exchanges of 'spiritual goods' in the "communion of saints" that Christian life can grow, develop, and be communicated." What, practically, are we do? Perhaps we can be more open to adult education opportunities offered by the parish than we might have been in the past. Or we can be more generous with our time at home to assist our children in their studies for religious education. Or we can pick up a good spiritual book for summer reading. 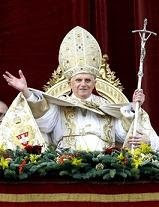 Our Holy Father Benedict, the pope, has written very beautifully of the Lord Jesus in a variety of books. One of these would be a good place to start. In these and in many ways we can grow in love of Christ as we grow to know Him more through the gift of our Faith. Always expect more from Christ than you give to Christ. He will never leave you disappointed. St. Cristóbal Magallanes and Companions, martyrs: “It was necessary that the word of God be spoken"
S Bernardine of Siena, priest: "nor is there any other name"
... given to man by which we may be saved." The invocation of the holy name of Jesus is the simplest way of praying always. When the holy name is repeated often by a humbly attentive heart, the prayer is not lost by heaping up empty phrases, but holds fast to the word and "brings forth fruit with patience." This prayer is possible "at all times" because it is not one occupation among others but the only occupation: that of loving God, which animates and transfigures every action in Christ Jesus. Image Credit: Fish Eaters where more may be found on devotion to the holy name of Jesus Christ by clicking here. Thursday, Easter IV: "Behold, one is coming after me"
At last Jesus' hour arrives: he commends his spirit into the Father's hands at the very moment when by his death he conquers death, so that, "raised from the dead by the glory of the Father," he might immediately give the Holy Spirit by "breathing" on his disciples. From this hour onward, the mission of Christ and the Spirit becomes the mission of the Church: "As the Father has sent me, even so I send you." Tuesday, Easter IV: "My sheep hear my voice"
"In [God's] hand is the life of every living thing and the breath of all mankind" (Job 12:10). Monday, Easter IV: “I am the good shepherd"
"The Church is, accordingly, a sheepfold, the sole and necessary gateway to which is Christ. It is also the flock of which God himself foretold that he would be the shepherd, and whose sheep, even though governed by human shepherds, are unfailingly nourished and led by Christ himself, the Good Shepherd and Prince of Shepherds, who gave his life for his sheep. There are many voices in the world today. In addition to cell phones, email, Facebook, chat and Skype we have the internet, news outlets, presidents on one side and terrorist jihadists on the other, bloggers, TV demagogues and talk show hosts, self-help gurus and purveyors of popular spiritual books through public appearances; all these and more have joined the chorus of voices calling out for our very limited attention along with those of our family members, our communities and our bishops. With our very great limitations as human beings how do we remain open to others in a way that would be pleasing to God, would be holy and in imitation of Jesus Christ our Lord, who exercised compassion for the many who sought him out for a sympathetic hearing, while also obeying Christ's command to refuse falsehood and error? We must be willing to listen in love to those others who ask for our attention as an expression of love, except in cases where we would be participating in sins such as gossip about the faults of others or lies about others. These are called detraction and calumny, excluded by the laws of God and matters for sacramental confession. We must also avoid listening to any talk such as abusive and angry speech, denigration of the gift of the marital act through lustful speech, advocacy of gratuitous violence outside of legitimate needs for self-defense, or speech which takes the Lord's Holy Name in vain. Priests when hearing confessions, for example, sometimes must ask the penitent to limit the description of any sins they are confessing to the briefest detail in order to avoid the near occasion of sin. And it is helpful to remind here that penitents are asked to name sins only by type, or species, and number. Beyond this, how can we exercise true compassion for others while also being able to say "no" to those things which are incompatible with our way of life in Christ? Jesus Christ unhesitatingly always responded with a firm and clear renunciation of anything which was incompatible with the holy will of His heavenly Father and we must do the same. 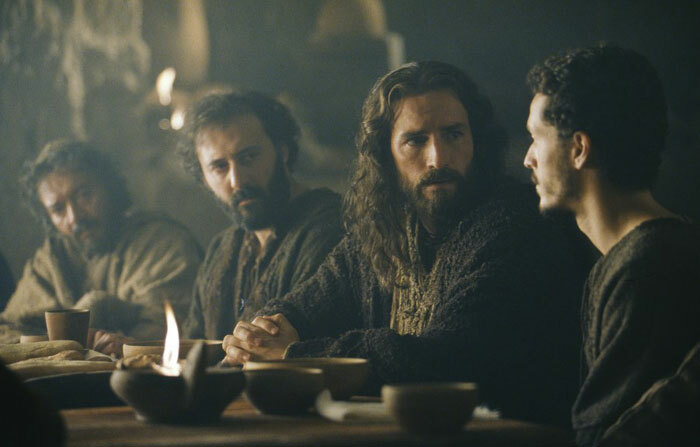 In today's Gospel, Jesus Christ says yes to the Father's will that there be but one visible flock in the world, one holy people that would be the Body of Christ as a corporeal group or family and recognizable to all who seek salvation. Jesus Christ says "yes" to the Father's plan for the universal Church, an ecclesia, qahal or a "calling forth" from the world and a setting apart from the world of those persons who belong to Christ and therefore also to the Father, giving and receiving Trinitarian love and life through the Holy Spirit of God. Those who desire to be members of the one, holy, catholic and apostolic Church of God are constantly formed as such by God through the active engagement of the intellect and will in the listening to and recognition of the voice of Christ the Redeemer. But how, we should ask, is His voice made known and heard? And why must we also renounce, that is refuse to recognize, the voices of certain others? Who are these others? 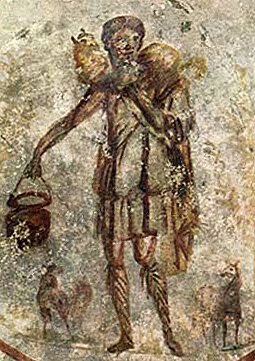 Our identity as members of the flock of the true Shepherd requires that we be able to do two things in order to be one with Him and to persevere in His love: we must both hear the voice of the Shepherd, Jesus Christ, and also refuse recognition of the voices of those the Lord calls "strangers". What is a stranger? A stranger is a person whom we do not know or who does not know us because they are from a distant place, though they may be approaching us and becoming more fully known to us. Those are strangers who are "estranged" from Christ because they persist in living apart from Him as He is present in His Body the Church. These strangers, whether intentionally or not, have closed themselves off from some aspect of the fullness of life he offers through His Church. The voice of Christ comes through the Church, through the Pope and the bishops in union with him whom Christ Himself commissioned: "Go and teach". The voice of Christ is also heard through the Scriptures, particularly as proclaimed by the Church in her liturgies. As the Second Vatican Council taught, Christ is present through the power of the Holy Spirit when the Scriptures are proclaimed. 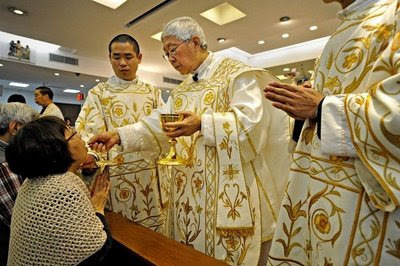 When we listen with careful and loving attention at Holy Mass as the Scriptures are proclaimed by the priest or deacon and the lectors, we truly hear the voice of the Shepherd who calls us and forms us as His holy Church, His Body in the world. Those who were cut to the heart in our first reading today, in shame at their complicity in the evil of crucifying the Lord, felt compelled to act in order to renounce the sin of rejecting God and to amend their lives by word and action. In order to find out what it was that they must do they turned to Peter, the one commissioned by the Lord Himself to be His voice, to speak for him so that the world, in hunger for salvation, might be fed with the life-giving truth by Christ our Life. Peter directs them to participation in the Church through the sacramental life: to be baptized. Thus they entered as we must also into the sheepfold of the Church. For those who have entered the sheepfold there follows the weekly participation in the Sunday Eucharist, the proclamation of the Word of God and the building up of baptismal graces through worthy reception of the Eucharist. And in order to receive the Eucharist in a sincere way one must first listen to and act upon the voice of Christ who invites us to become real and actual members of the Church. It is for this reason that those who are not Catholics in good standing are asked not to receive the Eucharist. Each must take responsibility for his or her free choices, whether to enter the Church or to remain outside the sheepfold and also to accept the consequences of those decisions. The strangers whose voices we must refuse to recognize unfortunately include also those fellow Christians who acknowledge only the Bible, for example, and do not accept all of the other gifts that come through Christ in the Church such as the sacraments and the teaching office of the Pope and bishops in union with him. We do love all of these sisters and brothers, but our love does not extend to believing with them any errors taught by the ecclesial groups to which they belong because to do so would be to disobey the Lord who commands: "do not recognize the voice of strangers". This demand can entail suffering as sometimes those discordant teachings and voices are taken up by our own family members whom we love and with whom we want to share the fullness of life in Christ. These persons must be invited to take Catholic instruction and to enter the Church through the RCIA program. Friday, Easter III: “I am the way and the truth and the life"
Thursday, Easter III: "believe that I AM"
receives me, and whoever receives me receives the one who sent me. Wednesday, Easter III: "I will not reject anyone who comes to me"
"No one comprehends the thoughts of God except the Spirit of God." Now God's Spirit, who reveals God, makes known to us Christ, his Word, his living Utterance, but the Spirit does not speak of himself. The Spirit who "has spoken through the prophets" makes us hear the Father's Word, but we do not hear the Spirit himself. We know him only in the movement by which he reveals the Word to us and disposes us to welcome him in faith. The Spirit of truth who "unveils" Christ to us "will not speak on his own." Such properly divine self-effacement explains why "the world cannot receive [him], because it neither sees him nor knows him," while those who believe in Christ know the Spirit because he dwells with them. "Daily" (epiousios) occurs nowhere else in the New Testament. Taken in a temporal sense, this word is a pedagogical repetition of "this day," to confirm us in trust "without reservation." Taken in the qualitative sense, it signifies what is necessary for life, and more broadly every good thing sufficient for subsistence. Taken literally (epi-ousios: "super-essential"), it refers directly to the Bread of Life, the Body of Christ, the "medicine of immortality," without which we have no life within us. Finally in this connection, its heavenly meaning is evident: "this day" is the Day of the Lord, the day of the feast of the kingdom, anticipated in the Eucharist that is already the foretaste of the kingdom to come. For this reason it is fitting for the Eucharistic liturgy to be celebrated each day. Monday, Easter III: "you are looking for me"
not because you saw signs but because you ate the loaves and were filled. The Church is our Mother: in & through her the Lord interprets what refers to Him in all the Scriptures and gives Himself in the "Breaking of Bread"
Happy Mother’s Day to everyone. Why everyone? We wouldn’t be here without our mothers. And in particular of course we wish a beautiful day of love and happiness to all of our mothers as they rejoice in the gift of being called to cooperate with God in giving the beautiful gift of life to their children. And they have done so also with a little help from our fathers, too. Why is the vocation of motherhood beautiful? And why is it appropriate that we take a day apart to celebrate and thank our mothers? This is because the gift of life is God’s most beautiful gift to each one of us and mothers have a unique role in God’s plan for life. Apart from Christ who went to the grave, giving Himself completely for our salvation, no one hands their bodies and lives over for the sake of another as our mothers are called to do. Some even risk their lives to give life and some, tragically, also lose their own lives for the sake of a child being born. We think of Saint Gianna Beretta Molla who said “yes” to life to a heroic degree, dying in the act of childbirth because she refused to treat the life of her child as less sacred than her own, rejecting the moral evil of abortion as suggested by some doctors because the child she carried in her womb posed a risk to her own life. Yes, life is sacred. Every human life. No exceptions. And mothers are beautiful cooperators in God’s plan that life should go on. The Church is called a mother also. Why is this? The gift of natural life that comes into the world through the holy cooperation of mothers and fathers is meant to share also in the supernatural life of God. Life is so wonderful that it should never end. Our Lord founded the Church so that He could continue to give His own life, through His Cross and Resurrection, until the end of the world. The sacraments of Baptism and the Eucharist flow from Christ to us through the Church, bride and mother, coming still from His wounded side as He died upon the Cross to give us the unending gift of His Resurrection. Mary, the mother of the Lord is the mother of each one of us in the Church also, given to us by our Lord as a final gift before He died. We look to her example, receiving the gift of faith and life from the Lord Jesus as she died, with humility, gratitude and joy. We rightly, therefore, also celebrate the motherhood of Mary, mother of Christ and mother of the Church on this day. In and through the Church Christ speaks and acts again today, giving the Holy Spirit to interpret once again for us all that refers to Him in the Scriptures and making Him present on our altar at holy Mass; it is Christ the Lord who again gives thanks, "breaking of the bread" of His Body for us. The Church is our mother, in her we grow into a mature Christian Faith. "The Breaking of the bread" is an ancient name for the Eucharistic Sacrifice of the Mass and recorded in Scripture. Each of us relives the wonder and awe of Emmaus at every Mass. We "know Jesus the Lord" in the most perfect way outside of heaven itself as the priest, acting in the person of Christ, offers the Mass. In this way we encounter the Resurrection as an historical and transcendent event. Earth and heaven come together in Jesus the God-Man as he appears before us on the altar of sacrifice. Thus, the place in which this event takes place becomes ”house of God and gate of heaven”. The Gospel records the appearances of the risen Christ and tells of the panic and fright, the joy and wonder of the women and the Apostles who first saw him. This is put down in writing so that we may know, even as we experience the same lack of belief as they surely did, that Christ really and truly rose from the dead. We must through God's grace overcome our lack of belief and embrace the virtue of faith more and more. "Lord I believe, help my unbelief." Without faith we cannot freely choose to love God as he commands us to do. It is through the virtue of love, freely chosen, of Jesus the risen Lord, encountered in faith, that we hope to share in the Resurrection of the Lord. Even the beautiful accounts of Jesus in the Gospel are only fully understood and accepted by faith. The Easter gift of the Eucharist is the fount of these and all the gifts of grace. Mary Magdelene and the other first witnesses of the empty tomb and the risen Christ, spread the joyful news with tears and smiles of heavenly joy. We, too, are messengers of the Resurrection; we live the glory of Easter through the transcendent gifts of faith, hope and love in action. Mother Elvira, the foundress of Comunita Cenacolo, a “school of life” for drug addicts and other young people at risk, calls us to be “missionaries of the smile”. We evangelize, spread the truth with a smile, transmitting to others the serene joy which is the fruit of faith that has placed hope in the resurrection of Divine Love Incarnate. Saturday, Easter II: "the number of disciples continued to grow"
Among the religious authorities of Jerusalem, not only were the Pharisee Nicodemus and the prominent Joseph of Arimathea both secret disciples of Jesus, but there was also long-standing dissension about him, so much so that St. John says of these authorities on the very eve of Christ's Passion, "many.. . believed in him", though very imperfectly. This is not surprising, if one recalls that on the day after Pentecost "a great many of the priests were obedient to the faith" and "some believers. . . belonged to the party of the Pharisees", to the point that St. James could tell St. Paul, "How many thousands there are among the Jews of those who have believed; and they are all zealous for the Law." Friday, Easter II: "recalling the Apostles, they had them flogged"
Every joy and suffering, every event and need can become the matter for thanksgiving which, sharing in that of Christ, should fill one's whole life: "Give thanks in all circumstances" (1 Thess 5:18). Thursday Easter II: "stop teaching in that name"
“We must obey God rather than men." Citizens are obliged in conscience not to follow the directives of civil authorities when they are contrary to the demands of the moral order. "We must obey God rather than men" (Acts 5:29). Wednesday, Easter II: "the light came into the world"
but people preferred darkness to light, because their works were evil.